Place ½ cup the water in a small bowl. Sprinkle gelatin over; let stand until gelatin softens, about 10 minutes. Line 3 L glass baking dish with plastic wrap, leaving overhang. Sprinkle 2 tablespoons powdered sugar over plastic wrap. Combine remaining ¾ cup water, 2 cups sugar, and 6 tablespoons corn syrup in heavy small saucepan with a candy thermometer attached to the pan. Stir over medium heat until sugar dissolves. Boil without stirring until thermometer registers 230˚F, occasionally swirling pan and brushing down sides with wet pastry brush, about 14 minutes (time will vary depending on size of pan). Stir in remaining 6 tablespoons corn syrup and vanilla. Transfer sugar mixture to a Kitchen Aid mixer with paddle attachment and add gelatin mixture. Beat on low speed until mixture turns opaque, about 5 minutes. Beat on medium-high until mixture is cool and forms soft white peaks, about 15 minutes. Pour into prepared dish and spread evenly with an off-set spatula. Dust with 2 tablespoons powdered sugar. Let stand at room temperature at least 8 hours to set (marshmallow will be soft). Cover and refrigerate. (Can be made 2 days ahead.). In a food processor, mix together the flours, sugar, baking powder, baking soda, salt, and cinnamon. Add the cold butter and process until the mixture resembles coarse meal, about 30 seconds. Add the honey, molasses, water, and vanilla. Mix until the dough starts to come together, another 30 seconds. Scrape dough out of the mixer. Roll the dough 1/8-inch thick – this is easiest done on parchment paper to keep it from sticking to the counter. Chill for at least 1 hour, until firm. Preheat oven to 350˚F. Remove dough from the fridge. With a sharp knife or pizza cutter, cut into 2-inch squares. Arrange the crackers on parchment lined baking sheets. With a toothpick, prick several holes in each cracker. Bake for 12 – 15 minutes, until lightly browned at the edges. Remove from the oven and allow to cool on the pan. In top of double boiler, melt chocolate. Set aside, but keep warm on stove. Place one graham cracker on plate. Cut marshmallow (with a heated knife) into 2-inch squares and place one on top of each cracker. 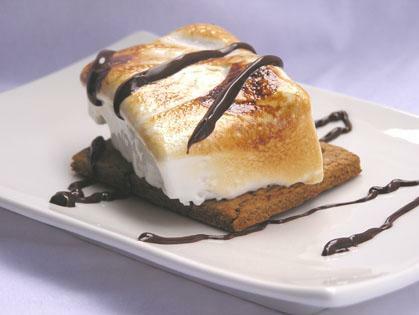 With a brûlée torch caramelize the top and sides of the marshmallow and top with melted chocolate. This recipe a concoction of a few recipes – from Bon Appétit and Gale Gand by way of Nicole of Baking Sheet, who made these graham crackers for SHF #7.
welcome back, where oh where have you been, you have been greatly missed!